Time just keeps flying by, and our Dakota Mae is almost 7 months old! Six months has been my favorite age so far. Although not yet crawling, she is observing and exploring everything and everyone around her, and clearly fascinated by it all. Up until 6 months, I had just been giving Dakota time on her tummy and back on the floor to roll and play in whichever way she was interested. She has been quite content playing with her feet, gnawing on a teether, or batting at a mobile. In the past month, she's also become a pro at rolling onto her tummy to grab a toy and rotating like a clock on her tummy. But since the 6-month mark, she's also been showing signs of wanting to explore, see, and do just a bit more. Which leads me to supported sitting. Traditional Montessorians usually advocate against supported sitting. They encourage parents to wait until their baby learns how to push up from their tummy into a sitting position on their own, which can happen as early as 7 months, but often later. In theory, I like this idea, but just as I placed Dakota on her tummy before she could roll on her own, I also helped Dakota sit up before she could get into that position by herself. I did this because she really enjoyed the different perspective, and getting to explore her toys and materials with both her hands in a sitting position. Sitting gives her a way to be closer to my level, and that in and of itself she loves. There are various forms and ways to start "supported sitting". I chose to wait until she showed signs of readiness to sit independently (holding her head back up fairly straight) to help her sit up, which for her was 6 months. Rather than Bumbo chairs or bouncers/walkers, I simply helped her figure out how to balance upright by sitting her between my legs on the floor, or with the Boppy around her. It really only took a week or so until she could sit up on her own without support - balancing her weight, albeit a bit wobbly. She toppled sometimes, and still does, but she's always on a soft surface and always on the floor to begin with, so never falls far. And this is how she learns her own body's abilities and limits! Though I can definitely see the appeal of the bumbo chair, walkers, bouncers, etc, the reason we haven't used these goes back to my Montessori training too. My issues with them (besides the noise!) is that they don't typically allow for free movement once the babies are placed inside. Babies don't get to learn how to balance if they are fully supported, and they can't reach in whatever direction they please. Instead, babies are essentially "stuck" which can lessen their motivation to sit and move on their own. I've also heard child PT's say that things like the bumbo chair put babies in an unnatural sitting position much earlier than they are ready. Lastly, some of these "supports" can lead to falls, more dangerous than from a sitting position on the floor. But to each his own, and if motherhood has taught me anything, it's "you do you" and what works for one family isn't what works for another. So now that Dakota is sitting on her own on the floor, I typically place a small basket of toys in front of her, allowing her to explore freely. I try to keep just 3 or 4 toys in the basket at a time, to not overwhelm, and then rotate them every week or so. 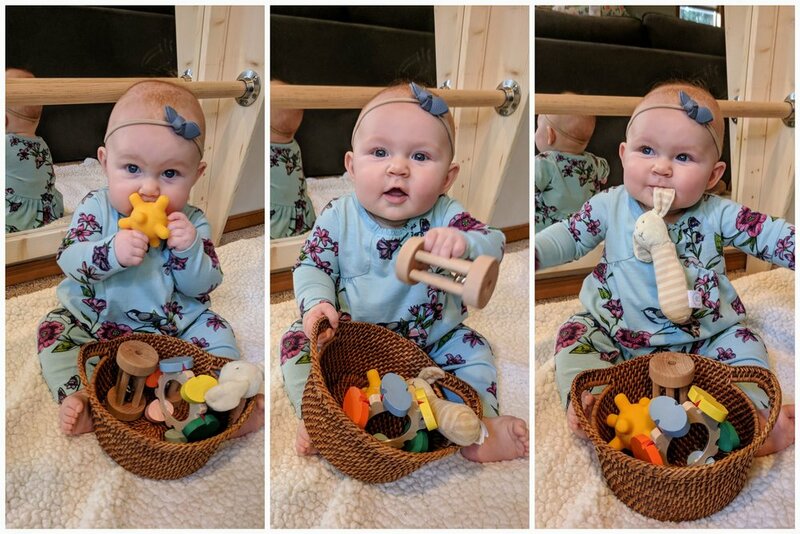 While playing in a sitting position, she gets practice using both of her hands, and transferring toys from one to another. She is also learning how to throw toys to her side, and then reach around to grab them. Sometimes she goes from sitting to lying down on her side, and unless she fusses about it, I just let her explore from there. With this independent sitting, she will eventually learn how to get into a crawling position from sitting, or down to her tummy and back up again! It is really fun to watch how she explores both her body and environment from this new perspective. It makes her so proud and happy! Stacking blocks - to knock over!